"These sausage and cream cheese stuffed mushrooms will be the hit of any party. Every time I make them everybody wants the recipe. This is the first time I've shared with such a big crowd. Enjoy!" Clean the mushrooms. Remove, chop and reserve the stems. In a medium bowl, gently mix the chopped mushroom stems, cream cheese and bread crumbs. Mix in the sausage and 1/4 cup red wine. Using a spoon, stuff the mushroom caps with the chopped stem mixture. Transfer to a large baking dish, and cover with the remaining red wine. Bake in the preheated oven 25 to 30 minutes, or until the mixture is lightly brown. 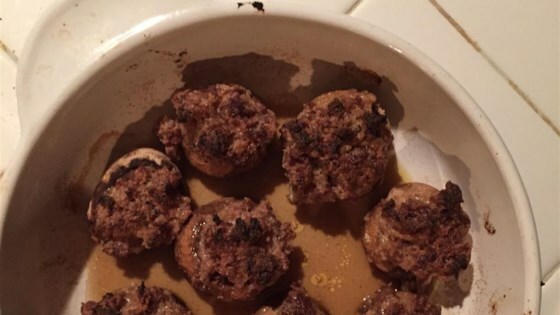 See how to make Sausage Stuffed Mushrooms. Think the mushrooms would have tasted better without the wine added in the end. I've used other stuffed mushroom recipes that were easier than this one. Reduced the recipe two two servings. Used Alouette instead of plain cream cheese; added garlic and fresh ground black pepper. Didn't add the wine. I have made these mushrooms for a few occassions and they are always a hit!!! Like the others, I added a bit of garlic to the mixture...cant wait to make them again. this was a huuuge hit on mother's day! I barely got to taste them myself! Even my dad tried and loved them...and he HATES mushrooms!